Takeaway: Maximum Yield is pleased to showcase some of the best modern growing products available on the market right now. In this post we are featuring products from Nanolux, Rainmaker Sprayers, Chikamasa, Hydrofarm, Tappin' Roots, Dr. Earth, and Smart Support. These products are all #GoodtoGrow. The new Vertical Grow Shelf System from Hydrofarm maximizes grow space while offering exceptional versatility. 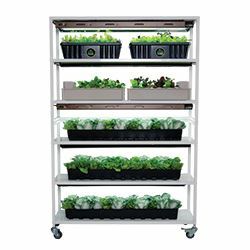 With adjustable shelves and several light fixture mounting options, the system can be adapted to allow for various plant growth stages. The VGS is available as a three- or six-shelf complete kit; all components are also sold individually. The system is on casters, allowing for even more flexibility, as it can be pushed or pulled in any direction smoothly. The unit is very sturdy and can support a total weight of up to 330 lbs. For propagation purposes, two four-foot T5 tubes (54W each) are recommended per shelf. If more light is desired, two four-foot LED Jump Start strips (48W each) are a great choice. As plants grow upward, it’s easy to just adjust the shelves accordingly. New Chikamasa B500SKF Antibacterial Trim Scissors are at the cutting edge of crop production and professional dried flower manicuring. In 2014, market research in Humboldt County, California led to Chikamasa and Dazey’s Supply (their US distributor) to envision and create the B500SKF. 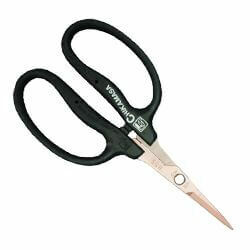 their now widely popular bonsai trim scissors with a curved blade. Equipped with a lab-tested antibacterial coating, the B500SKF prevents the spread of 90 per cent of germs and bacteria including E. Coli and Staphylococcus Aureus. This equals less contamination during propagation, which in turn results in a cleaner, safer product for end users. Progressive legal farms, processors, and propagation enthusiasts can all appreciate the delicate precision of Chikamasa’s elite scissors line. 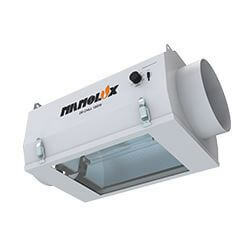 The Nanolux DE Chill is the first DE commercial overlap fixture of its type on the market. The DE Chill is designed with an onboard ballast, is air-cooled, and comes NCCS APP-ready. The air-cooled design removes up to 60 per cent of heat load in grow facility environments. This greatly reduces the air conditioning required to maintain the growing environment at desired temperatures. The fully enclosed design uses an optical quality glass lens which only reduces light output by six per cent. This six per cent reduction is easily offset by the ability to lower your lights closer to your plants and therefore raising light intensities far above 20 per cent. If left at the same height, one would only require 104 lights in a facility which would regularly require 100 open-style DE lights. The 4,000W required to run the four additional lights and the small wattage draw for exhaust fans is minor compared to the savings from lower electrical consumption required to AC the growroom. Dr. Earth Final Stop Yard & Garden Insect Killer Spray is an OMRI-listed insect killer that is all natural and highly effective at controlling aphids, mites, whiteflies, caterpillars, and other nasty insects. Our hand-crafted blend of essential oils and other natural ingredients work to kill pests immediately on contact. 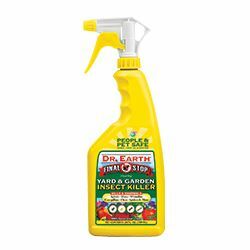 Dr. Earth Final Stop Yard & Garden Insect Killer Spray is ready to use and contains rosemary, sesame, peppermint, and cinnamon oil, as well as other potent ingredients which eliminate pests in a people and pet safe manner. 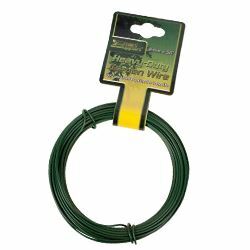 Smart Support Heavy Duty Garden Wire makes a great all-purpose tie for plant support and other garden jobs, indoors and out. Featuring a durable UV-stabilized plastic coating, this two-millimeter-thick steel wire is strong enough to brace hefty stems and can be cut to the desired length for a variety of uses around the grow room, yard, and home. For retailers, Smart Support garden essentials are available exclusively through BWGS. 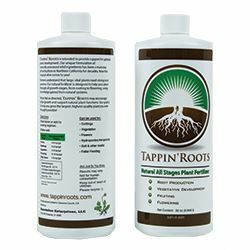 Hydrofarm is now offering Tappin’ Roots All Stages, a fertilizer made from botanical extracts that are high in micronutrients and are specifically rich in phytohormones. This powerful recipe of natural extracts works synergistically to stimulate and regulate plant growth functions, fine-tuning all stages of growth to a higher level of health and vitality. Visible, impressive and 100 per cent natural results can be seen within days of application. The wild harvested ingredients are hand crafted using ecologically sustainable methods. Each batch is processed using no synthetic chemicals, providing for a natural and biodegradable product. It can be used at full strength with no worries about burning or nutrient lockout. Another first from Rainmaker, the Rainmaker Battery Powered 18 Volt Backpack Sprayer is an all-purpose sprayer ideal for hand watering, applying herbicides, pesticides, liquid fertilizer, and for use in many home applications. Using the included premium Sanyo rechargeable and removable battery pack, you’ll get hours of use on a single charge. You can adjust the flow from low to high with the flip of a switch. 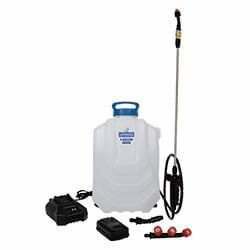 Product includes a 22.5-inch lance with quick-connect feature for the nozzle attachments, three spray nozzles from fine mist to stream, a trigger with a lock-on option that can be engaged for continuous spraying, padded shoulder straps, an integrated filter and a four-foot hose.